Connecting Online is a free online conference that takes place on the first full weekend of February. CO16 is a collaborative, inclusive, world wide community initiative that involves future educators, leaders in schools & colleges, and business' involved in training at all levels. The virtual conference will be held online using WizIQ platform and would be hosted by Dr. Nellie Deutsch. The theme of CO16 is ‘Teaching Online to Improve Instruction and Learning in Education and Business’. It would be a treasure trove of amazing insights and experiences of leveraging the power of the internet for instruction and learning. An event that’s not worth missing for anything in the world! Experiences with technology in face-to-face and online classes. Best practices: What worked and what didn't work? How do you use technology to promote your online workshops, consultation, and communities? Participants who reflect on 10 webinars and fill in a feedback form will be awarded a certificate of participation. WizIQ is giving away 3 premium memberships each day of the conference for an year. This would be decided through raffle using Random Picker. 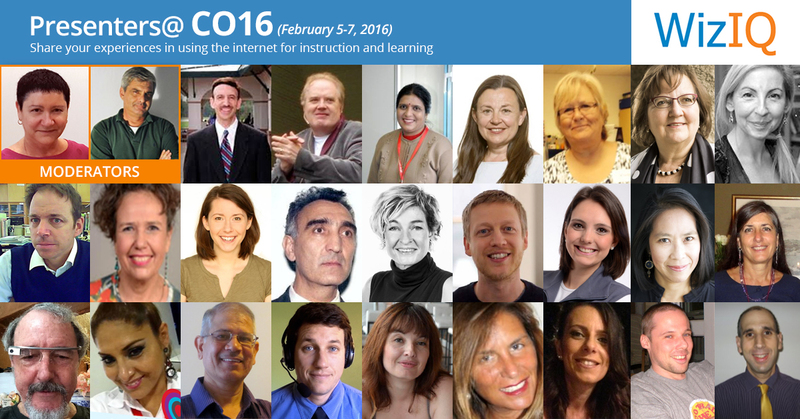 Join the 6th annual connecting online (CO09-CO16) on February 5-7 on WizIQ Live Class. You are cordially invited to join the live online conference on the weekend of Feb 5-7, 2016. Each presentation will be for 45 min with 10 min for questions and answers. Please enroll in CO16 conference area for learning that goes beyond the classroom.